This is Part 2. If you’d like to start with Part 1 and read the whole story, you’ll find it here. Our second morning came early, accompanied by a beautiful sunrise and we boarded our buses to travel about 60 miles away to a place called Sixth Crossing. We started the morning with another river crossing, and this time our missionary guides reminded us that youth in the 19th century would never have rolled up their pant legs or hitched up their skirts as they crossed a river and they encouraged our youth to do the same. It certainly made the crossing a bit more challenging. And some of our gallant young men chose to ferry some of the young women across to keep them from having to get wet. It was a sweet scene and probably one of the more “fun” parts of the trek.After a couple of miles and a break for lunch, we took part in what is called “The Women’s Pull.” During this event, the young men hiked ahead about a mile or so up the next hill where they waited along the trail and took part in a brief devotional. The young women remained with the handcarts and, after their devotional, it was time for them to pull their handcarts up and over the hill. It wasn’t a small hill and it was a warm day. It was a good reminder to our young women that they can do hard things, just as their pioneer ancestors did. We also have the women’s pull to remind us that not only did many women have to travel without husbands in this journey, but in 1848, while we were still recovering from the US government’s refusal to intervene against the persecutions of the Mormons, the US Army came to Brigham Young and asked him to provide volunteers to go fight against Mexico. 500 faithful men went, choosing to honor their citizenship and not turn their backs on the country they felt abandoned them, leaving their women and children to make their way across the plains alone. Even now, their sacrifice amazes me. I focused on watching the young women’s faces as they pushed and pulled their handcarts up the hot and dusty hill. Their determination, their focus, their joy, their exhaustion. Some of the girls spoke afterward about how, as they felt they could go no further, their carts suddenly became easier to pull and they looked around to see who had stepped in to help, but saw no extra helpers there. As our young men waited along the trail at the top of the hill, they were constrained from stepping in and had to watch from the sidelines. I heard many say how hard it was for them not to be able to step in and lift the burdens of their “sisters”. After all the girls had arrived at the top we invited all the youth to write their feelings and experiences in their journals. For many of the youth, this was the spiritual highlight of their trip. It was a beautiful and moving sight and an experience I will not ever forget. We hiked together the remaining couple of miles back to camp, where the youth spent the evening square dancing and engaging in pioneer pastimes. The evening was capped off by a visit from a Pony Express rider with letters from home for every youth. The next morning dawned cloudy and cool and still a little drizzly. The cool weather was certainly a blessing, but the rain left the first mile of the trail a sticky, clay mud mess. As we set out for our 15-mile trek across Rocky Ridge (an apt name if ever I heard one), the mud caked on everything, sometimes several inches thick. 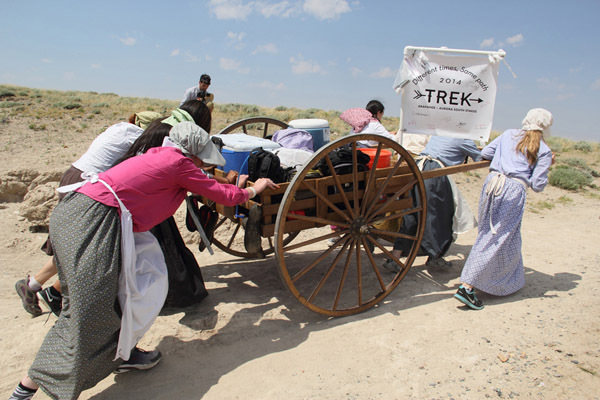 The handcart wheels were thickened and bogged down and the youth struggled hard to hike in mud-caked shoes. My daughter lost one of her shoes in the mud and had to rely on someone else to retrieve it for her. As they climbed the hill, the mud began to be replaced by rock and the struggle continued. 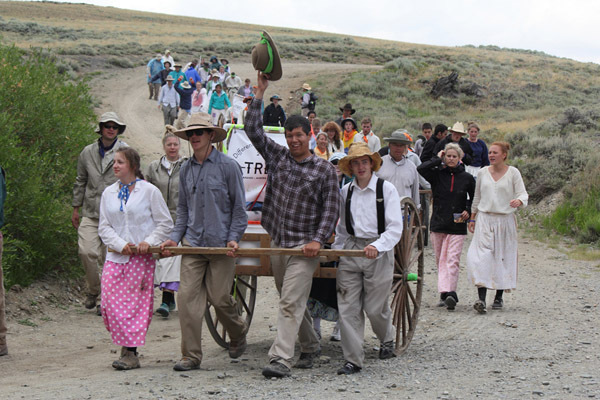 The youth heard many stories along the way, including one re-enactment of a woman who ended up pulling her husband in the handcart when he was too weak to walk. She told him that she would not let him die on the trail and he was going to Zion with her, so she put him in the handcart and pulled him herself (and yes, they both made it). It was a beautiful experience to see these youth work so hard and to struggle to pull their handcarts over Rocky Ridge. As I looked out over the scene and could see nothing but mountains and plains for miles, I realized it must have looked much the same when the pioneers were there. I felt closeness to my spiritual ancestors that I had not known before. We ended our trek at a beautiful place called Rock Creek Hollow where the pioneers had camped and lost 13 of their company in one night. We held a testimony meeting there where we were lifted by youth sharing their feelings about the trek and the gospel of Jesus Christ. It was a life-changing experience for many of them. It was a life-changing experience for me. The pioneers were willing to give up everything for the blessings of the gospel of Jesus Christ. Many of them did give up everything, including their lives, so they and their children would have the blessings of the temple, of eternal families and of salvation and exaltation. This thought came to me that very first day and, as I walked, I pondered on it. What am I willing to give up for those blessings? What sacrifices would I make to have the blessings of the gospel? I have been a member of Christ’s church since I was five years old. I realized on the trek that I have often taken that blessing for granted. I need to live in a way that is more mindful and more intentional, that actively reflects upon the gratitude I have for these blessings. The Pioneer Handcart Trek has definitely changed me. Not in outward ways that anyone would notice, but in more subtle personal ways. I have begun re-evaluating my life and working to replace old limiting habits with new freeing ones, to focus more on the things that really matter and less on the things that don’t matter so much. I am so grateful for my trek experience and will feel doubly blessed if I am asked to serve again.